The Renowned television series 'Monarchy' was repeated recently; it includes a fair amount of Fortescue history as well as Dr David Starkey speaking inside St Eadburgha's church alongside the tomb of Sir John Fortescue. Click here to watch the programme. Inside St Eadburgha’s Church, Ebrington, there is a notable, historic and significant tomb, positioned alongside the main Altar. This is the final resting place of Sir John Fortescue, c.1394 – c.1479; MP for Tavistock in 1421, Governor of Lincolns Inn, King's Sergeant at Law in 1441, and in the following year chief justice of the King's Bench. Knighted in 1442, he held office during the remainder of the reign of the Lancastrian King Henry VI, to whom he was loyal; as a result, he was attainted of treason by the Yorkist King Edward IV, when he deposed Henry in 1461. When Henry fled into Scotland, he is widely supposed to have appointed Fortescue, who appears to have accompanied him in his flight, “Chancellor of England”. In 1463 Fortescue accompanied Queen Margaret and her court in their exile in France. It is likely that while there he was tutor to the crown prince, Edward, and that his important legal work “De laudibus legum Angliae” [in praise of English law] was written for the prince's instruction. In this he first expressed the view that "one would much rather that twenty guilty persons should escape the punishment of death, than that one innocent person should be condemned, and suffer capitally". Following the Battle of Tewkesbury in 1471, he complied with a demand from King Edward IV to refute his attacks on the Yorkist throne, he was pardoned, reinstated as a Royal Counsellor and had his property restored. He returned to live the remainder of his long life in Ebrington, where he had purchased the title of Lord of the Manor in 1456. Fortescue had been born in Devon, and it is believed that he was educated at Exeter College, Oxford, where, to this day, students of Law join the ‘John Fortescue Society’. 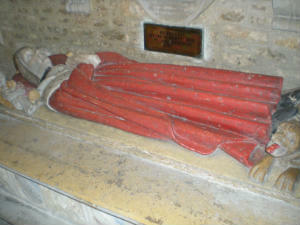 His tomb in Ebrington is one of the historical features of the county, The painted effigy presents him as Lord Chief Justice in a long full robe with wide sleeves and narrow upright collar with the Official cloak fastened on the left shoulder beneath the ermine tippet and hood. The head lies on a square tasselled cushion set diagonally with a supporting angel at each side. The feet, in pointed shoes, rest on a lion – a symbol of the British Constitution. The centuries have taken their toll on this important altar tomb; ingress of moisture [there being no foundations beneath] are causing significant efflorescence, flaking and powdering; mouldings are splitting, several being held together only by hardened Victorian over-painting of the original delicate vibrant colours, result it is now becoming quite a sorry sight. The tomb is significantly capitulating forward under its own weight; the top slab is estimated to weigh 1.5 tonnes and the 2 metre long effigy over 1 tonne. Funding is being sought, unsuccessfully at present, to restore our ‘sinking’ Chancellor and return him to his former glory.